James Tse snapped this stunning photo of the partial solar eclipse on Nov. 25, 2011 from New Zealand. As consumers in the United States hunted for bargains last Friday (Nov. 25) on one of the busiest shopping days of the year, a few lucky skywatchers in New Zealand were treated to a very different kind of "Black Friday" — a partial solar eclipse that darkened the sky over parts of the southern hemisphere. Last Friday, the moon passed between Earth and the sun, creating a partial solar eclipse for the fourth and final time this year. The eclipse was only visible from certain locations in the southern hemisphere, including pockets of southern South Africa, across the Antarctic continent, Tasmania and parts of New Zealand. At greatest eclipse, the moon covered 90.5 percent of the sun's diameter from the point closest to the axis of Earth's shadow, which is a location in the Bellingshausen Sea on the west side of the Antarctic Peninsula, according to NASA scientists. This photo of the partial solar eclipse on Nov. 25, 2011 was taken by Terre Maize-Nicholson from Otaki Beach in New Zealand. Mike Nicholson and his wife, Terre Maize-Nicholson, saw the eclipse from Otaki Beach in New Zealand. While hazy conditions and strong winds threatened to spoil the show, they were able to snap some breath-taking images of the concealed sun. "We left home about 30 [minutes] before the eclipse started, drove to [the] beach, and had to hide in the car as the weather was pretty vile," Nicholson told SPACE.com in an email. "At the time conditions were also extremely hazy; the sun was just a big white blob above the horizon. However as it descended toward the horizon and into the low cloud, conditions improved visually." 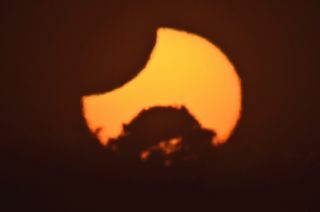 Skywatcher James Tse from Christchurch, New Zealand, snapped this photo of the partial solar eclipse on Nov. 25, 2011. Observer James Tse caught a glimpse of the solar eclipsefrom Christchurch, New Zealand. As the sun was blackened by the moon, it "was distorted like a lady shoe during the mid-eclipse," Tse told SPACE.com in an email. Nicholson and Tse shared some of their solar-eclipse photos on the website Spaceweather.com. This photo was taken by skywatcher Tom Loten, from Christchurch, New Zealand on Nov. 25, 2011. Solar eclipses are some of nature's most dramatic celestial events, and occur when the Earth, moon and sun are aligned on the same plane. Partial solar eclipses happen when the moon partly covers the sun as it travels between our planet and its closest star. The eclipse Nov. 25 was the fourth and final one of the year. Partial solar eclipses previously occurred on Jan. 4, June 1 and July 1. The next solar eclipse will occur May 20, 2012, and is expected to be a stunning event. The eclipse will be visible from China, Japan and parts of the United States, according to NASA scientists. During this so-called annular solar eclipse, the moon will cover a large portion (but not all) of the sun.